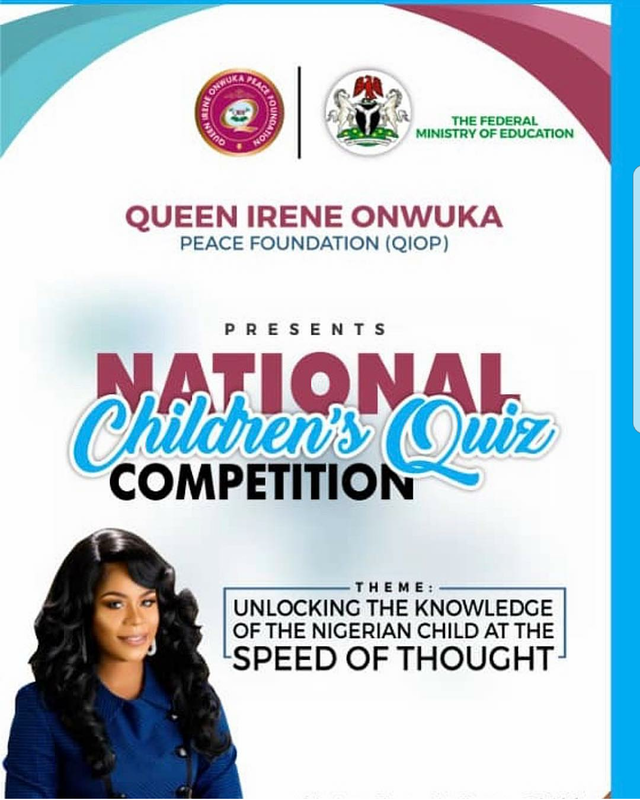 Queen Irene Onwuka Peace Foundation in collaboration with Ministry of Education is set the organise the National Children's Quiz Competition on the 11th of April at NAF Conference Center, Abuja. The competition which will commence at 10:00am will be hosting children from all the 36 states that has been screened as participants for the competition. According to the organisers, the national competition is themed "Unlocking the Knowledge of the Nigerian Child at the Speed of Thought" and the quiz will focus on subjects like Mathematics, Spelling Bees, Current Affairs and general knowledge. While reacting to the forthcoming innovative children quiz competition, the Convener, Queen Irene Onwuka told our correspondence that the initiative is targeted at rebuilding pace of thought in the average Nigerian Child. She stressed that the idea is to engage children in a process that can rapidly help them explore the usage of their brains through thinking. According to notable reports, the winner of the competition will be rewarded with one(1) million naira, and the first runner up will get Five Hundred thousand naira(500,000), with the second runner-up receiving the sum of three hundred thousand naira(300,000). 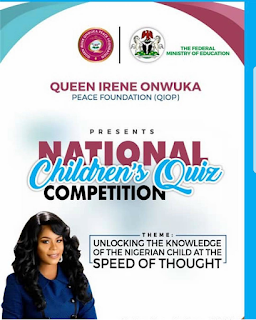 The organiser of the National Children's Quiz Competition, Queen Irene Onwuka was a former Miss Ambassador for Peace; a beauty queen that has distinguished herself at all levels of impact, especially in human capacity building and charity. In her concluding words she stated that Nigerians must be committed to enhancing education, because any investment in knowledge pays the best interest.